Egg whites are one of my favorite things to have for breakfast. Whether they are in an omelet or just scrambled, they are the best! I also enjoy the fact that they are healthier for you than egg yolks. Have you ever stopped to think about how a lot of your favorite foods contain eggs? Whether you enjoy pasta, pancakes, cakes, brownies, french toast or waffles, the eggy goodness is in there. If you regularly have eggs in your diet, why not switch to an all natural brand that is safe for you? Safest Choice Eggs are all natural, vegetarian, and kosher. The company takes fresh shell eggs and slowly, gently pasteurizes them in a warm water bath. This method kills salmonella bacteria and viruses. Safest Choice eggs look, cook, and taste like farm-fresh eggs, yet are safe to eat any way you like even raw! Every time you eat eggs now, you can feel secure and confident knowing you've made a safe decision. What will you make the first time you purchase Safest Choice eggs? How about a birthday cake, or even some delicious chocolate chip pancakes? The sky's the limit! This summer, Safest Choice is encouraging cooks from across the nation to beat the kitchen heat with a no bake recipe contest. Now through August 30th, the brand's Facebook fans can show off their culinary skills and submit their custom recipes for a chance to win luxurious vacation for two to Sarasota, Florida. The trip includes an exclusive culinary lesson with world renowned chef and cookbook author Giuliano Hazan. Get those noggins fired up and maybe it will be you who will win the trip! I want to be sure I am serving something safe for my family but yet tastes exactly like regular eggs. water bathed to kill bacteria? great for making ceasar salad dressing. I would like to be sure they are safe to eat, and are health. I try to eat as many healthy foods as I can (and can afford). I have bought Davidson's Safest Choice Eggs before at ShopRite. I want my eggs to be raised humanely and be safe and healthy. I like that they are safer, no virus or bacteria. I am always looking for healthier products for my family. I would buy these! I like that they use warm water to kill salmonella bacteria and viruses, which makes the eggs safer to use. I have heard so much about eggshells and even the cartons being contaminated that I hate touching them. Obviously, I would like to have Safest Choice Eggs for my kitchen. I'd like to try them to eat healthier. My family loves eggs, but we all have dietary restrictions and I want ot make sure that we are eating the healthiest eggs possible. I would love to try this...I'm not a huge fan of eggs, but would like to have more in my diet. I Want To Eat Safe Eggs So I Can Insure My Family Is Eating Healthy, Safe Choices. I'm almost a vegetarian, I don't eat red meat or poultry. Because of this I appreciate vegetarian fed hens. I like that they contain no salmonella or viruses, so I'll be reassured of safety. I would love to incorporate them to be healthier. I would feel better serving these safer eggs to my family. I would like to incorporate safe eggs into my diet because it would make me feel better about eating eggs. As a vegetarian, eggs are a good way for me to get protein but I don't always feel like their the safest food to eat. I want to be sure that the eggs I eat are safe and healthy. I want to start eating healthier! I would like to add them into meals because they are nutritious and healthy. I would be able to serve more eggs to my kids. I have huge anxiety with unsafe foods and get afraid they won't be cooked safely. I cracked open my first rotten egg last week! I want to make sure my eggs are edible and safe! 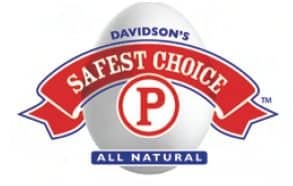 Davidson's Safest Choice® Eggs are pasteurized. Nothing wrong with that. Very good! like to incorporate safe eggs into my diet so that I can feel healthier and know that my family is safer. I'd like to know that my eggs dont have bacteria or samonella in them and my kids aren't going to get sick eating them! As we grow older, it seems like a losing battle. I can remember the early cloresterol scares where eggs disappeared off the breakfast menu for many. Eventually eggs in moderation again became ok. but they had to be properly cooked which left out runny sunnyside up eggs. These eggs can be runny - and I'd love to try them out. I want to eat healthy and safe eggs. I want to incorporate safe eggs into my diet because I am trying to eat more natural. Safe eggs for a pregnant women (and everyone in general) is a must! that would be me. I want to make sure the eggs I eat are the safest for me and my family! I would like to like to incorporate safe eggs into my cooking because if the egg was a little under cooked in my baking and cooking I wouldn't have to worry as much. are these available in florida? My daughters are really getting into eating eggs lately so I would want to make sure they are getting the best possible ones out there. Thank you! I want safe food for me and my family. I want to incorporate Safest Choice eggs into my egg cream and my cookie dough that my husband likes to eat raw. I want the eggs I eat to be the best and healtiest. I'd love to try these for healthier breakfast recipes. I like how they are a safer product. It would be great if eggs were free from bacteria and salmonella. I want to incorporate them into my diet so I feel healthy and I know it's safe for me and my family! Because I have had one very serious food bourne illness. I would like to have safer food. I want safest choice eggs because these eggs help reduce the chance of getting food poisoning.Many time regular eggs are dirty on the outside and sometimes have uric acid on the shell.These eggs will not have that on their shells. We would love to incorporate safest choice eggs for the protein that they offer !!! We eat very little meat in our household so alternative protein sources are a must !! I want to incorporate safe eggs into my diet because I am expecting baby number two in November. I like to know that the eggs I eat are bacteria free. I want my family to eat healthy. I want to incorporate anything that is healthy. Sounds like this would be my new eggs. I don't want my or my family to get food poisoning. We should eat more eggs anyhow but I love to eat raw cookie dough and this would make it much less likely to make me sick. I would like to get as much unnatural substances out of our diets. I can eat these eggs over easy without endangering my health. I need healthier food options! There are so many problems with eggs and bacteria. I would love to have the piece of mind that they are healthy and safe. I want to be sure that I am serving safe food. Thanks for the review. I would like to be sure that what I serve is safe. Thanks for the review. I would like to know that I am serving the best eggs to my family. Because I love eggs, but I am so NOT a fan of salmonella! I do a lot of baking with my kids and they always want to taste the batter or cookie dough but I am afraid of the eggs used in them so it would be nice to have an egg that is safe. I want to make sure everything I cook for my kids is safe. As a single mom I don't want to have to worry about their health because I bought the wrong foods. I would buy these because they are healthier for me and my family! I would buy these for me and my family because they are healthy! I cook with eggs a lot, but of course I would like to have safe foods for my family! I eat eggs for breakfast every morning so I want to know I'm eating something safe. colleenaw@hotmail.com. It is a better and healthier alternative to everything else in the market! I would like to incorporate safe eggs into my family's diet because eggs can carry salmonella, plus as nasty as those crowded chicken houses are, you never know what you might get. I want to eat products that are safe for pregnancy. This fits the bill. We eat eggs a lot, I want to make sure Im eating safe ones. I would like to try them, so I would feel comfortable letting my kids eat cookie dough. I would love to incorporate them in my baking to ensure any raw dough I eat is safe. I would like to incorporate Safe eggs ,because they are a good source of biotin, and will help me reduce my hair loss. I have seen Salmonella poisoning in person and it's not pretty. it would be nice and safe for the family but taste good. Older ppl need to be extra careful about food safety (along with young children). Eggs can be a real problem, so ensuring you are purchasing quality, safe eggs is worth it! You can enjoy them and not have to worry. because of no hormones . I do not like hormones or anything artifical in foods . I know 2 people who have had salmonella. Uh....no, thanks. I eat eggs daily & I wish I could have chickens so that I could have m own fresh eggs...However, I live in the city & my yard is hardly a yard & it just can't happen...I'd love to have these eggs for use daily not only for my diet but to ensure my children's future health. To have a healthy, safe choice! I love that they are safe to eat raw, because then I could go back to eating raw chocolate chip cookie dough without worrying that I was going to get sick. I want to get more protein into my diet. I'd like to make some things that require raw eggs like hollandaise and mayonnaise without risking salmonella. I could once again eat all of those goodies from my childhood that require not fully cooked or raw eggs. Eggs are one of my favorite things to make for my children. It is important I buy only safe ingredients. Their health and safety is too important. I want to serve my family safe eggs. I do a lot of baking, and like to use quality ingredients. These eggs would be a better option than the eggs I currently use. I like that they are safe and healthy....one reason why I have my own chickens and have 3 fresh eggs every day. I want safe eggs because I want my kids to have the best and be safe. I like that it's safer and a bit healthier. We eat alot of eggs in our house! Because my kids enjoy a taste of raw cookie dough, so it's great that these eggs are safe to eat raw. I absolutely love my smoothies with raw eggs. I'd make some milk shakes with egg that I don't do now because of health concerns. My son got salmonella poisoning once. It is nothing to fool around with, for sure. Who wouldn't want to keep their family safe? There is lots of news lately of widespread food related sickness. I don't want that to happen to my family! very neat idea, I hadn't heard of these before. I would use them for baking,but of course for omelets and scrambled eggs, eggs over easy would be good too, hubby loves those and I worry that by having them like that and not fully cooked he'd get sick, so they would be perfect for that. I would incorporate them to get more protein in my diet. I eat low carb most of the time, so I eat a lot of eggs, so I need them to be safe, plus I have a toddler who loves eggs & I of course only want the best & safest for him. I would like to add more protein to my diet. That's interesting you can eat them raw!! I wonder how much nutrients they still have in them? My son loves eggs and I would feel better knowing the eggs are safer. We love our eggs in my family so this would be great to have. Eggs can be nutritious but if they are safe that's even better! In case I undercook them, it eliminates the fear of salmonella. I care about what my family eats so these eggs would be great. I am always hearing about E-coli poisoning due to raw eggs being eaten. With the Safest Choice Eggs I will know that I am serving whats best for my family while helping to keep them all healthy and well. I like to serve quality and safe food and since I like to eat my eggs over easy I feel safer to eat a better egg. I like to put healthy foods in my family meals so healthy eggs will really help us live a healthier lifestyle. I'm pregnant currently so food safety is a really big concern. A product like this would give me one less thing to worry about. Shame to use an old saying but if it fits...'it is better to be safe than sorry'. since the shells are pasteurized in a warm water bath killing salmonella bacteria and viruses I don't have to worry about bacteria when handling them. I would like to eat because they are healthy and are safe!! I like the idea of natural and gentle handling of Safe eggs...and hopefully they are cage free too. :-) Thank you. I'd love to incorporate the safe eggs, just to totally eliminate the fear of bacteria, or getting sick from them. While it'd be nice if chickens in the US were vaccinated against salmonella like they are in Europe, this seems like an acceptable alternative. My kids like to sample batter and I worry about the eggs in the batter. I have them for breakfast all the time. Our family loves egg dishes like omelettes and I want our food to be as healthy and safe as possible.